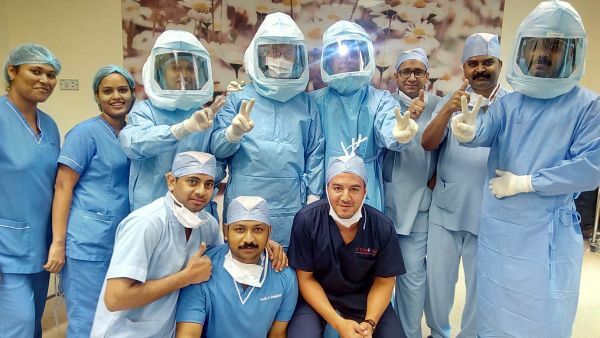 Two UAE patients who suffered from serious knee injuries are recovering well from orthopaedic surgeries which were telecasted live from the operating rooms at Zulekha Hospitals Sharjah and Dubai to an audience of healthcare professionals. As part of Zulekha Hospitals’ commitment to sharing best innovative medical approaches with colleagues and associates in the local healthcare community, the surgeries were broadcast consecutively from both the Sharjah and Dubai facilities. The audience comprised 124 clinicians, including orthopaedic specialists, physiotherapists, surgeons, physicians, and radiologists who gathered at Le Meridian Hotel in Dubai to first witness a total knee replacement surgery (TKR), followed by an arthroscopic anterior cruciate ligament reconstruction (ACL) which were performed by two teams of Zulekha Hospital orthopaedic surgeons on Friday, 4th March. Prof Dr Fawzi Benomran, Senior Consultant and Director of Department of Forensic Medicine, Dubai Police General Headquarters, was impressed by the innovative technique for skin closure with a special glue rather than the staples or sutures normally used in TKR surgery. One patient, a 56 year old UAE resident, had been suffering from severe osteoarthritis, acute pain, deformity and swelling in his right knee for the past few years. After reviewing his long-term medical history of unsuccessful treatments, Dr Biju Pankappilly, Specialist Orthopaedic Surgeon and Dr Maher H.Z Al Rawi, Consultant Orthopaedic Surgeon from Zulekha Hospital Sharjah decided that only TKR surgery could improve the patient’s life. Dr Pankappilly said: “Standard treatments including analgesics, physiotherapy and intraarticular injections did not give him appreciable results and he’d lived for years suffering from agonising pain. Similarly, a 34 year old patient who sustained a knee ligament injury while playing cricket, was operated on by Dr Rahul Shivadey and Dr Chidananda P. Shivashankar, Orthopedic Surgeons from Zulekha Hospital Dubai, and was able to walk the day after his ACL surgery was completed. “We operated on him with a minimal invasive technique to reduce the recovery time and to get him back on his feet the day after the surgery,” said Dr Shivadey. Both live orthopaedic surgeries were part of Zulekha Hospitals’ long-term involvement in the Continuing Medical Education (CME) initiative, serving as a best medical practice forum for healthcare specialists from the UAE. The panel discussion chaired by Dr Ahmed Zubaidi from Kuwaiti Hospital and Dr Ali Hejazi from Rashid Hospital, was followed by a Q&A with Zulekha Hospitals’ surgeons after the surgeries were completed and the recordings of both operations will be used for further educational purposes by Zulekha Hospitals. In recent years, Zulekha Hospitals has received extensive recognition for its commitment towards quality care and sustainable business practises, including Joint Commission International Accreditation for patient care and safety, and College of American Pathologists Accreditation for pathology and laboratory medicine standards.